April 28th at Noon – 4 p.m. Woodward Park, Fresno. Tickets: $10 for JASNA Members/$12 general. GET TICKETS: Tickets are on sale online until 9 p.m. PST on Friday, April 27th. Or tickets can be purchased between 12 p.m. and 12:30 p.m. at the picnic site. The 2016 Walking Party and Picnic was one of our most popular events incorporating a social event with historical costuming fun! 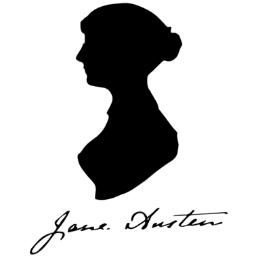 The chance to get together and enjoy an outdoor afternoon socializing in much the manner as Jane Austen might have done was too tempting to some of us to pass up, so we decided to do it again this year. We hope you’ll be persuaded to join us! There is a $5 (cash) per car entry fee to the park. Carpooling recommended. Children are absolutely welcome at this event, but please note that JASNA Central California does not provide child care or supervision at this event. If you don’t know if you can make it, you can still purchase a ticket at the event if you arrive between Noon and 12:30 p.m. at the welcome table next to the Green and White awning. Read on to find out what you should know to attend in style! Also there are recommended sandwich shops at the bottom of this post! 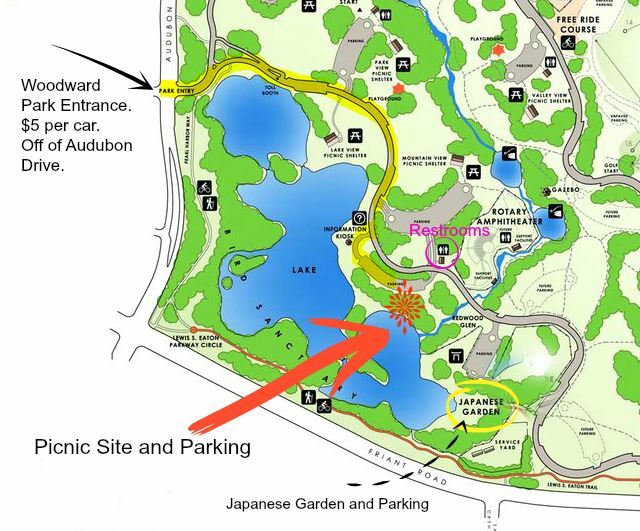 We will meet in the free area next to the lakes, just before you see the Redwood Glen, within walking distance of the Shinzen Garden entrance. Look for the green and white striped awning! The event officially begins at Noon, with picnics and games between 12:30 p.m. and 2 p.m., then walking to the Japanese Gardens for a stroll from 2 p.m. – 3 p.m. or so. We anticipate the event to wrap up by 4 p.m. Please feel free to join us at any time convenient to you and to stay as long or as short a time as you please. If you arrive and we’re in the Japanese Gardens, simply call or text us at 559-384-2973 and we’ll come out to meet you! Bring your own picnic lunch! Make up your own basket or stop by one of the local casual restaurants to pick up an order to go. See below for a list of options in the area of Woodward Park. Your ticket includes beverages, fruit snacks, and entrance to the Japanese Gardens. Bring your own chair or picnic blanket to spread out. Regency dress is admired but NOT required. If you are partial to another era, you’re welcome to wear any era of picnic costumery you like. Or you may come in modern clothes if they suit you best! We’d simply like the pleasure of your company! We will have versions of bocce ball, badminton on hand. Please feel free to bring any other games you may wish to play while we picnic. Also suggested equipment: parasols, hand fans, sunblock and comfortable flat walking shoes! This is a terrific event to get to know some of our area JASNA members a little better, ask questions about our activities or about historical costume, or to just get a feel for our world of Janeites. Corn (canned, frozen or fresh), Duck pellets (sold online and at pet stores), Lettuce, other greens (torn into small pieces), Frozen peas (defrosted), Oats (rolled or instant), Seeds (including birdseed or other varieties). Do not feed the ducks bread as it can make them sick. We recommend Panera, Corner Bakery Cafe and Sourdough and Co for the freshest sandwiches and most convenient take away service. You can order in advance and quickly pick up your picnic and take away! Butterfish Poke, The Corner Bakery Cafe, Tofas Mediterranean Grill, Pieology, Trader Joe’s, Habit Burger. Panera, Starbucks, Cafe Rio, Chipotle, Mimi’s Cafe, Subway.